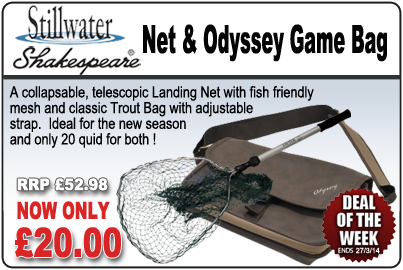 Deal of the Week - Stillwater Net and Shakespeare Odyssey Game Bag - RRP £52.98, Now only £20.00! What a deal! The Stillwater Net is collapsable, telescopic and manufactured to the highest standard. Also featuring knotless, fish-friendly mesh, it's perfect for Trout Fishing or as a general net for other reasonably sized species. Couple this with the Shakespeare Odyssey Game Bag with it's faux leather flap and adjustable shoulder strap and you have the perfect net and bag combo for the new season. This deal is so good that it will definitely sell fast so don't hesitate and grab yours while stocks last!